Second, China’s President Xi Jinping spoke with Indian Prime Minister Narendra Modi to bolster collaboration between the two nations on the One Belt One Road initiative, which will connect China with many other nations across Europe, Asia and Africa. Modi approved of more Chinese investment. Xi also emphasized that China and India should better manage security in border regions. Third, the New Development Bank was officially launched with $50 billion startup capital. The Bank is to finance large infrastructure and development projects. The objectives of the New Development Bank fall in line with China’s aims to build up infrastructure and investment for the One Belt One Road initiative. To this end, economic cooperation among the BRICS member nations was emphasized. The BRICS alliance has been viewed by some to be a means through which China can exercise its power outside of the U.S.-dominated international institutions. The creation of a dollar currency reserve pool to avoid the need for an IMF bailout may point in this direction. The statement that economic sanctions should be lifted on Iran if the nation dismantles its nuclear program reveals a more neutral foreign policy than has been called for by the U.S. and European Union. Even China’s deep engagement with Russia on economic issues can be seen as skirting U.S. policy on Russia, which again in conjunction with the EU, has imposed sanctions on Russia for annexing Crimea. However, this may be a somewhat biased perspective. After all, if it were not for the dominance of the U.S. dollar and the growth-dampening impacts of IMF loan conditions, the creation of a dollar reserve currency may not be necessary. In addition, despite the imposition of economic sanctions on Iran, they have yet to achieve their end goal. So, is China wrong to engage Iran (and Russia) as an alternative to isolating them? These economic and foreign policy issues are too complex to be viewed as “following U.S. leadership,” or “pushing back against U.S. leadership.” China in the BRICS is attempting to promote the economic and political development of emerging markets, which are by definition not a part of the Western developed-nation group. These countries have their own approaches to international relations, and do not appear to be operating as an anti-Western body. 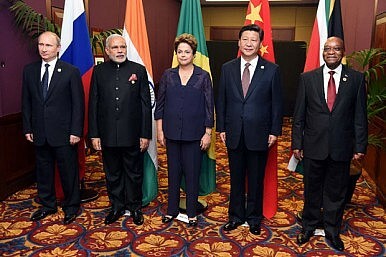 China in the BRICS Summit acted productively, not only for China but also for other nations. The promotion of economic activity in various global regions helps to generate growth elsewhere, as growth is not a zero-sum game. China in the BRICS should be viewed positively and not as a threat.